A two day trip to the Mae Klong River in Thailand saw us once again fishing on a TBS TV production. The first day saw three small Giant freshwater stingrays landed and also several small Bull Sharks. The second day saw the Japanese team attached to a much larger Giant freshwater stingray which towed the boat some distance downstream. The freshwater stingray then tightly hugged the riverbed causing the battle to come to a stalemate. After repositioning the boat above the stingray the angler began to apply pressure from directly above. The stingray was soon moving again and taking line from the multiplier. The battle raged on for well over an hour before the Giant freshwater stingray was brought off the bottom where it glided around under the fishing boat. Several minutes passed as the fish was slowly and gently brought up over the waiting net. The Giant freshwater stingray was measured at a width of 2.05m and was estimated to weigh 235kg. 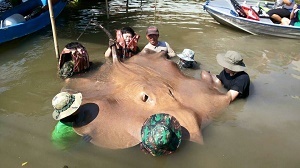 After a short examination by VRMC Chulalongkorn university the stingray was released back into the Mae Klong River.